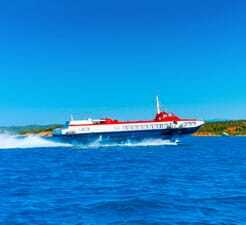 At directferries.co.uk you can plan, compare and book your ferry to Cyclades Islands sailing to the port of Schinoussa quickly, easily and securely online. Using our fare search you can check timetables, live prices and availability for Ferries to Schinoussa, or compare your destination with alternative ports, not just in Cyclades Islands, but further afield too. All you need to do is enter the relevant information into our 'Fare Search' and hit search to continue. The flying cat from Naxos to Schinoussa was a speedy and enjoyable crossing. My only criticism is with the actual direct ferries website. They don't make it cler where you have to collect your ticket from because there is no ferry terminal for ticket colelction in Naxos. You have to go to the Hellenic Seaways main office on the main street in Naxos. It is is easy to find as it is on the coast opposite the harbour (so near the ferries) but if you didn't have much time you wouldn't have known this and could miss your ferry. "ferry from Koufonissi to Schinoussa"
"Trip to Piraeus July 2014"
Great pity that in a structure the size and scope of ship like the Blue star Paros that credit cards are not accepted on board! We were almost out of money, the ATM was out of service and it was activated just 1 hour before arrival so 2 stars for this. The rest all ok though and despite the rough sea we did not feel in the least bit unsettled, unlike the hydrofoils that makes you vomit out your soul in the event of rough seas.